How often do have a meeting feeling like you all ended with the same required tasks as the last time you met, simply because no-one did anything. Hang on, did they know they were meant to? A global survey of 38,000 people found that ineffective meetings are on of the top three corporate time wasters. According to the survey the average worker spends nearly six hours each week in meetings (and executives spend up to 23 hours a week!) yet more than two thirds of them believe that meetings aren’t productive! Why more meeting? It’s probably because more and more companies are organised around teams – and teams require meetings. Organisations are becoming flatter with less structure and making more use of self-directed teams. The assumption is that employees have information and other resources that the organisation needs to tap into, and the important ideas and innovation can emerge through employee interaction. A meeting is often the vehicle of choice. We have meetings like any other organisation, but with Mike and I often away facilitating workshops and delivering keynotes, it’s critical that we can guarantee a method for defining responsibilities and ensuring action afterwards. 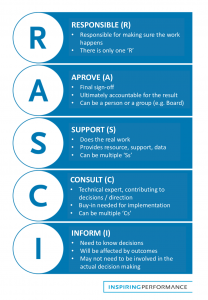 ‘RASCI’ is a solid framework we recommend to everyone, and it’s embedded into how our clients execute their strategy. Once tasks, objectives, or even your strategic top challenges, assign who’s responsible for making it happen. They’re then responsible for using the framework to get clear on all stakeholders. But remember, this isn’t just about strategy or programmes of work. At the end of every single meeting someone should be asking the question “Who is the ‘R’ for that task?”. And here’s another simple hint, if the purpose of the meeting isn’t to answer a specific question, then you probably shouldn’t be having the meeting in the first place. Hopefully this helps you take back some of your week. With all that extra time, you might like to treat yourself to the perils of your own intranet, or re-stacking the dishwasher that was labelled ‘Dirty’ when it was actually ‘Clean’!